What Type of Legacy Will You Leave? Every individual has a desire to be remembered for something great. We want to be seen as someone who has truly made a difference, and seek to be known as more than average. We aspire to live a life like Joe Medicine Crow. Medicine Crow died Sunday, April 3, 2016 at the age of 102. He was the Crow’s last war chief and the sole surviving link to a long military tradition. Despite the hardships he faced being raised on the Crow Reservation in the early 20th century, Medicine Crow lead by example and succeeded in every aspect of his life. Medicine Crow was determined to show all people, not only his own, that Native Americans had the potential to achieve anything they desired. He proved that Native Americans are capable of greatness while still remaining true to their heritage and strong upbringing. Joe Medicine Crow understood that legacy isn't only about recording one’s achievements, it is also about bequeathing knowledge and experiences gained through life’s unpredictable journey. 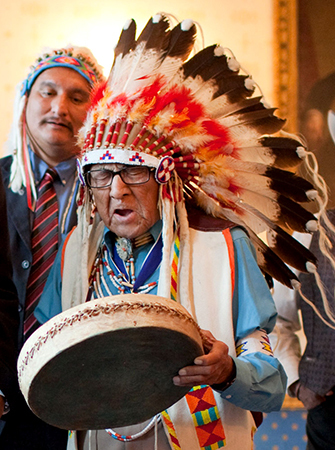 Joe Medicine Crow: A War Chief Historian and the Last Link to the Battle of Little Big Horn Dies at 102.